Denim Overalls (I have talked about how much I love this denim line again and again – I also own these and these). Shoes: Converse. Top: Joules. Raincoat: Stutterheim. Bag: Mansur Gavriel (shop all their new collection here including this gingham bag I have my eye on). Such a cute overalls look! ❤️😘❤️ You have made a rainy day look more beautiful! So in love with the cute dungarees look! Such a cute and stylish rainy day outfit! pastel pink is your colour. Such a fun outfit and of course with the perfect pop of pink! This is such a cute look! I definitely need to get a pink raincoat! Love this! Makes me excited for spring to come around! Cutest look on you!! You’re perfect. Pastel Pink a color now considered a classic. Great sneakers Blair . Well isn’t this just the cutest! Makes me long for spring! Absolutely adorable, Bee! xo. How cute is that pink raincoat?? WANT! Your outfit could not be any cuter! This is such a fun casual look! I love the matching pink accessories! overalls + stripes + converse = perfection! You make the rain look pretty darn fun! Just bought these overalls last week & can’t wait to wear them! Love how you styled them here. 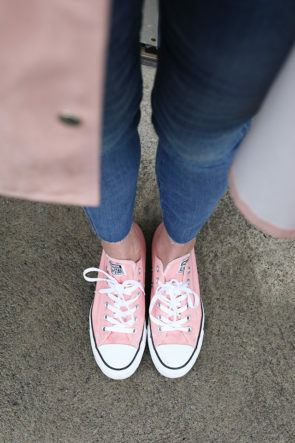 I love wearing denim overalls and they look so cute with the pink Converse shoes! Your hair looks amazing and I LOVE the overalls! This is so adorable! It is ALWAYS raining here in Portland, so thanks for some great inspo to get me out there door! PS Where’s your umbrella from? Hi! Where is your umbrella from?